One of the most enjoyable times for the new hobbyist is watching the flurry of activity in the aquarium after that pinch or two of fish food hits the surface. Sometimes we’re tempted to repeat the show 2-3 times a day, which is fine if your fish consume all the food within a couple minutes. The problems start if there is excess food, which is defined as “overfeeding.” Overfeeding is the most common source of the algal nutrients ammonia and phosphate. Algae thrive on both the nutrients generated from uneaten food and fish waste. Many experienced hobbyists who learn to resist the feeding frenzy and only feed once daily – or feed smaller portions 2-3 times daily – find it’s much easier to keep the unwanted green in check. If you turn on your aquarium lights when you wake up and turn them off before bed, the extended light cycle may be encouraging extra algae growth. Put your lights on a timer to replicate a day/night schedule and stick to it. Keep lights on 10-14 hours per day for planted aquariums, 6-10 for ornamental setups. Also, change bulbs at least once a year. Aquarium bulbs lose their spectrum and intensity as they age; this weakened light will likely encourage algae growth. In nature, rain and water currents refresh water conditions by diluting and carrying away nitrate (a.k.a. algae fertilizer) before it can build up to excessive levels. Your closed aquarium system, however, requires regular water changes to remove excess nutrients. Ideal frequency is 10% weekly, but for a lightly populated aquarium, 30% monthly is sufficient. It’s also a chance to siphon up all the sludge and dead plant matter in your gravel. 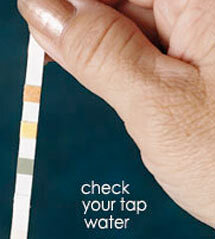 It is a good practice to test your tap water before changes, because it may contain algae-encouraging elements right out of the faucet. If the test results show significant levels of phosphate or other algae inducing elements, your battle against algae via water changes will be futile until they are reduced by an RO unit or a tap water filter. Keep algae’s favorite nutrient out of your aquarium with phosphate controlling media and biological boosters for your filtration system. The right choice of filter media can make a big difference in phosphate levels: Drs. 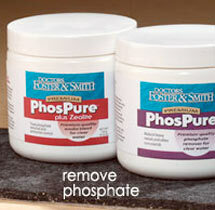 Foster & Smith PhosPure® Filter Media will remove phosphate and heavy metals. Combination Carbon-Phosphate Remover products are also available. The carbon keeps your water crystal clear and removes dissolved organics, the phosphate disappears, and best of all, so does the algae. Finally, change your mechanical and chemical media once a month, because as it becomes exhausted and saturated, it may leach the bad stuff back into your aquarium. Algae on glass or acrylic has no chance against convenient scrapers like the Mag-Float, or the Kent Marine Pro-Scraper II. What do you have under your aquarium cabinet? The more plants in your aquarium, the less chance algae has of taking over. Plants compete directly with algae for light and nutrients, and most often win if given proper conditions. For marine aquariums, consider beneficial macro algae such as Chaetomorpha placed within a connected refugium or sump filter. Put some fish in your community to work on cleanup duty. While many algae-eating Plecos grow far too large for small aquariums, the Dwarf Otocinclus Catfish is just the right size. This hardy worker seems endlessly busy, seeking out any plant or structure with a hint of algae. Another small catfish, the Cory Cat, patrols the bottom of your aquarium, vacuuming up excess fish food before it can rot and turn into dangerous ammonia and nitrite. For marine aquariums, consider a Reef Claner Pack. These convenient packages provide a natural and effective solution for marine hobbyists. Green Carpet Algae, which covers glass and structures is relatively easy to clean because we have the most weapons to combat it, including: algae scrubbers, and algae-eating catfish and invertebrates. Green Hair Algae is more stubborn, and even catfish and plecos may avoid it. Again, your best protection starts with water quality so you don’t have to roll up your sleeves later. Beard Algae is the black scourge of planted aquarium hobbyists. A major takeover by this unsightly guest may only be remedied by pruning away covered leaves and removing affected driftwood. Take a moment to sit back and look at your planted aquarium. Does it look natural? Is there a hint of green covering driftwood or rocks which makes the structures blend in with the underwater garden? If it’s not covering your glass or choking out the leaves of your plants, there’s little reason to panic. Algae may be unsightly, but it actually consumes excess nutrients and provides oxygen. No one “wins” the battle against algae. Success is finding a natural balance in your enclosed ecosystem.